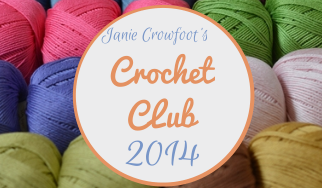 At last I have time on a Sunday to sit down and show you the first part of Janie Crowfoot's 2014 Crochet Club. Unfortunately, the reason I have time on my hands is because I am sitting at my mum's hospital bedside, occupying myself whilst she sleeps, so there may well be a few mistakes littering this post, as my mind becomes preoccupied by other things. The observant of you will note that these are photos from the February pattern, which I've got round to writing up on 30th March, so I'm sure you can imagine how far I am along with the March parts of the pattern - hardly at all! However, this in no way reflects my enjoyment of the club; whilst initially I was a bit worried about the whole tension thing (amigurumi allows me to have the free reign to use whatever hook I like with no consequence other than larger or smaller toys at the end of it!) it was nice to actually push myself to use the right hook at the correct tension to go forward for an end purpose. This presented another challenge - blocking. I don't think I've ever really blocked anything, I perhaps have half-heartedly attempted it on a couple of things but this was the real deal; making sure things were the necessary size and shape for when they finally come together as one big piece. I scoured the Ravelry Group looking for advice and decided to try a hot steam iron hovered about 1 inch above the pieces and luckily it worked out very well. It looked just like the pattern picture! Just read this now and I'm so sorry to hear that your mom was in the hospital, is she alright? I hope she is okay or at the very least doing better and that all will be well soon! 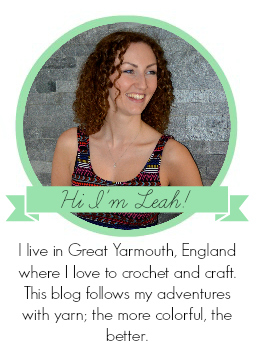 Congrats on your Crochet Club progress so far, the colours are lovely and good for you for blocking! I have never blocked but I feel I might have to once I'm finished the blanket I'm working on, kinda anxious about it as it's huge and will have to be done in sections, eep! Hi J, She's doing much better now thanks :) Was all a bit scary for a while but she's out of hospital and resting at home and well on the way to getting better now.